Lines of villagers eagerly waiting to receive winter relief items snaked up and around the snowy terraces of Helambu, Nepal this morning. Groups of families and friends huddled together against the cold at 8,500 feet above sea level. Some held walking sticks from their hours-long trek. Too many wore sandals with bare feet simply because that’s all they have. These Himalayan people are braving their first winter since the devastating earthquake last April, and thousands of them scarcely have enough to survive. Today, Samaritan’s Purse distributed emergency relief kits to nearly 1,000 mountain families who lost everything and have little means of acquiring help. Our teams have been working around the clock since our 747 of supplies landed in Kathmandu on Tuesday to assemble the kits and transport them by helicopter to several remote communities. 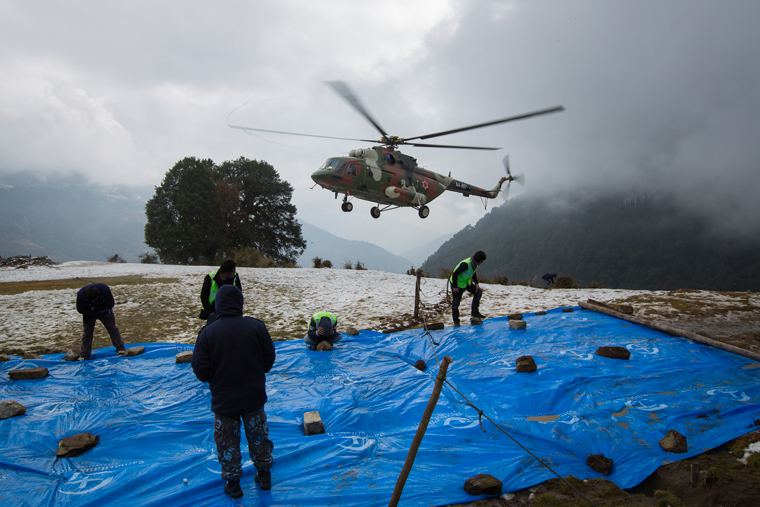 Helicopters are transporting relief to remote areas of Nepal. Blue duffel bags full of blankets, jackets, gloves, hats, socks, a sleeping mat, hot water bottles, and more brought smiles to the weary faces of those suffering through the snow and fog. “I’m happy to be here,” 59-year-old Dawa Dolma said. She woke up at 3 a.m. and walked for four hours with her two friends to be able to receive the items. They were tired and hungry, but thankful to be getting things to keep them warm. “This cold has been unbearable,” she said. The excitement heightened in the village as Nepalese government officials flew in to show their support, including Shakti Bahadur Basnet, Nepal’s Home Affairs Minister. He addressed the crowd, affirming their efforts to rebuild their lives despite the difficulties. “Your presence here shows how determined you are to move forward in life,” he said. Shakti Bahadur Basnet, Nepal’s Home Affairs Minister, spoke at the distribution, encouraging villagers and thanking Samaritan’s Purse. Pema said it’s been even more difficult for her community this winter—both because the earthquake destroyed their homes and the current fuel crisis (caused by India’s blockade) is crippling their supply chain for basic necessities. Although smiles and gratitude filled the air throughout the day, the trauma of this past year has taken a toll. If the suffering wasn’t immediately apparent on some faces, it wasn’t far below the surface. When 85-year-old Pema Khento Sherpa sat down to rest by herself on a large rock next to the distribution line, a woman visiting from Kathmandu saw how cold she looked. The woman took off her own wool scarf and put it around Pema. Then the two of them began to cry. Samaritan’s Purse Vice President Ken Isaacs addressed those gathered for the distribution. 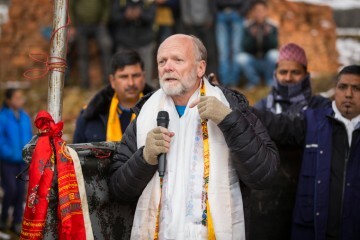 Daniel Mendies, a Nepali, has served with Samaritan’s Purse since the earthquake and has been sleeping outside in the villages, along with a dozen other staff, to organize the winter distribution logistics. 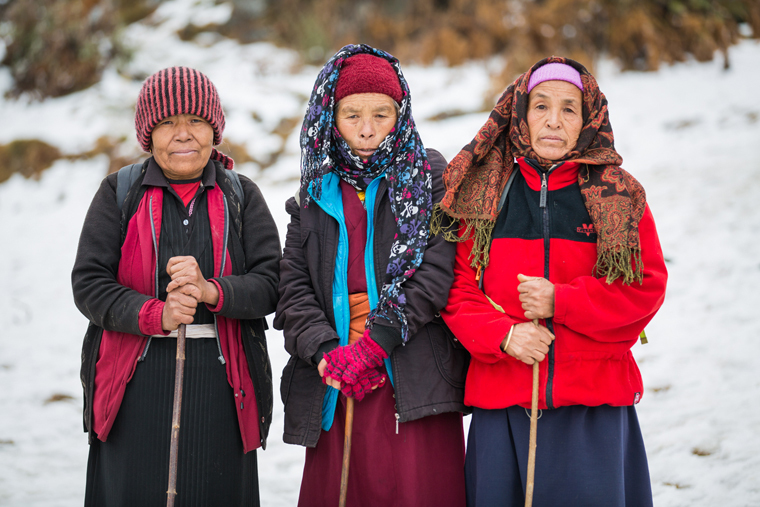 After the distribution ended, Maya Sherpa, 65, went home to unpack her winter kit. Maya’s right hand was crushed in the earthquake, and she hasn’t been able to use it. Her daughter-in-law helps her do things like comb her hair and change her clothes. Dawa and her friends who walked four hours to receive winter relief items from Samaritan’s Purse. Maya said she didn’t know what would be in the blue Samaritan’s Purse duffel bag, but she really hoped there would be something for her hand. When she and her family sat next to the fire in their one-room home and pulled out the various items, Maya found a pair of gloves. “I’m very happy,” she said with a big laugh. Samaritan’s Purse is reaching 5,000 isolated, earthquake-affected families over the next several days with emergency winter relief supplies. Please pray for clear skies as we fly these desperately needed items to remote locations and demonstrate the love of Christ.